The Mercedes-Benz Museum at the company’s headquarters in Stuttgart, Germany is a depository of the history of the automobile, motorsport, commercial transportation and the Twentieth Century altogether, presented in one of the most modern museums in the world. 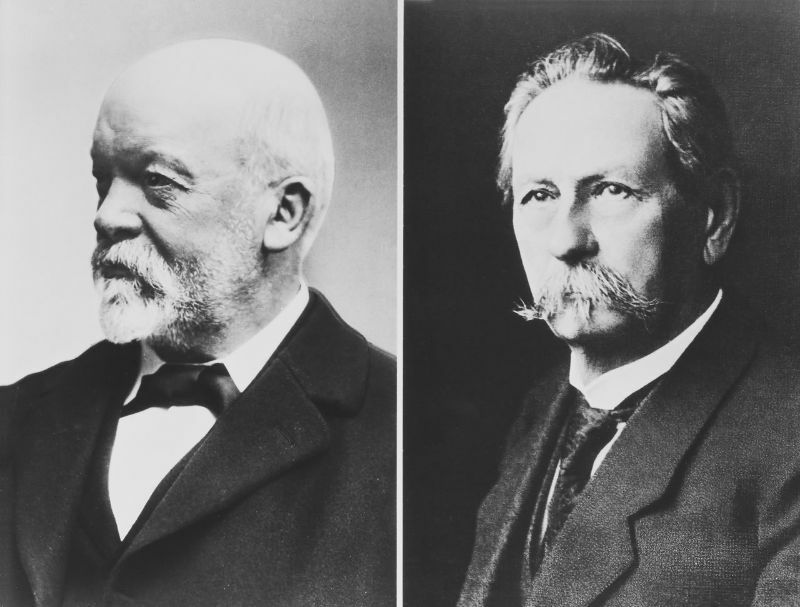 Two names, Gottlieb Daimler and Karl Benz, stand above all others in the company’s history. But there were many others, both known and unknown, who contributed to the history of the longest-established automaker in the world. 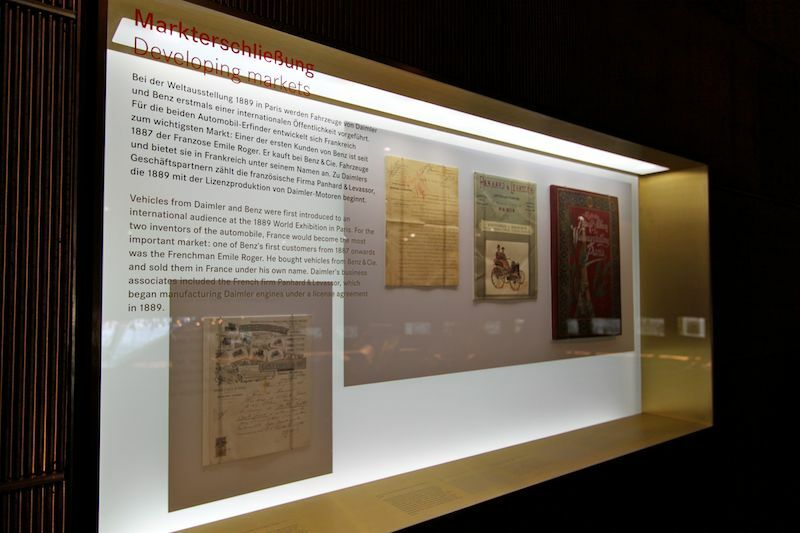 They are also represented in the singular exhibits of the Mercedes-Benz museum, particularly in Mercedes-Benz’ long history of success in motorsport. 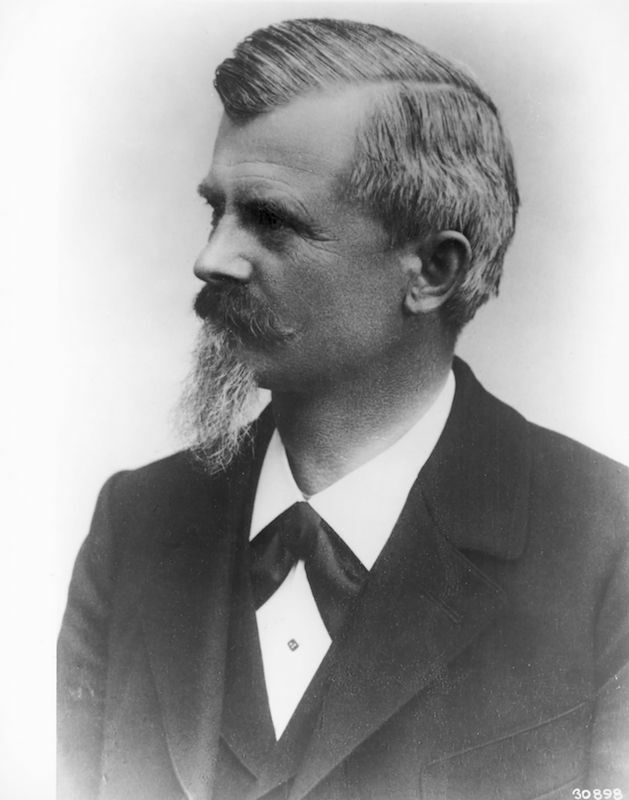 Karl Benz patented a three-wheeled vehicle driven by a gasoline engine in Mannheim, Germany in 1886, the same year Gottlieb Daimler completed his motorized carriage in Cannstatt, Germany. The world’s first two automobiles came into being barely 100 miles from each other, built by men who had not previously met but whose names became synonymous with the development of the automobile—Daimler-Benz. 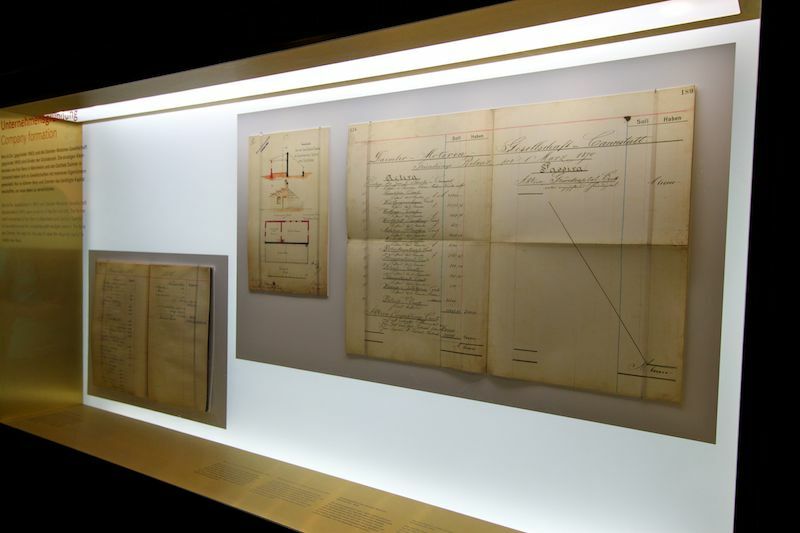 Although the companies founded by these men were not combined until 1926, both Daimler and Benz were early leaders in the new industry, contributing significant engineering innovations and advances in quality. 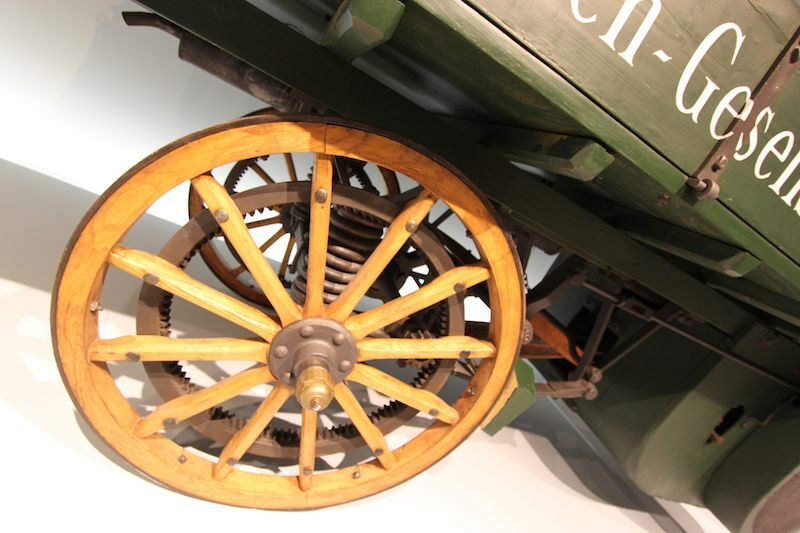 The Benz Patent-Motorwagen was a three-wheeled vehicle with two tall wheels flanking the rear-mounted single-cylinder engine that drove the wheels by a leather belt and chain drive. 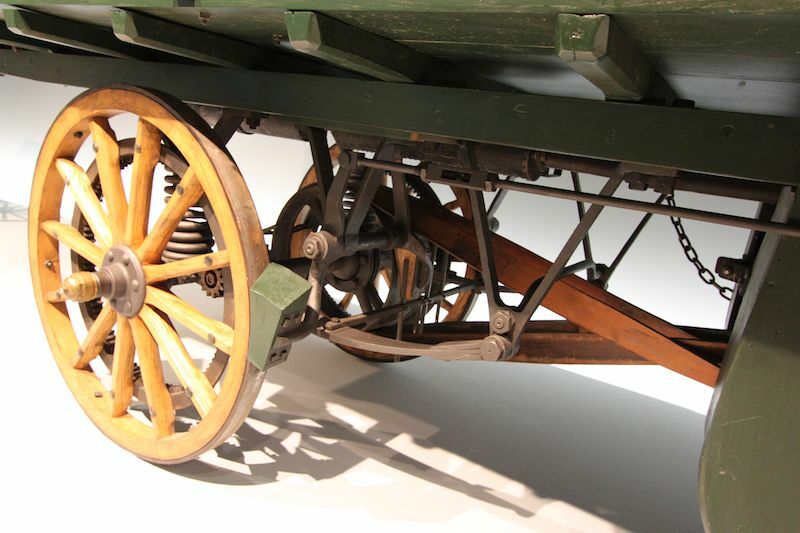 A steering tiller directed the single front wheel, because Benz was not confident of the two-wheel steering designs available in the day. 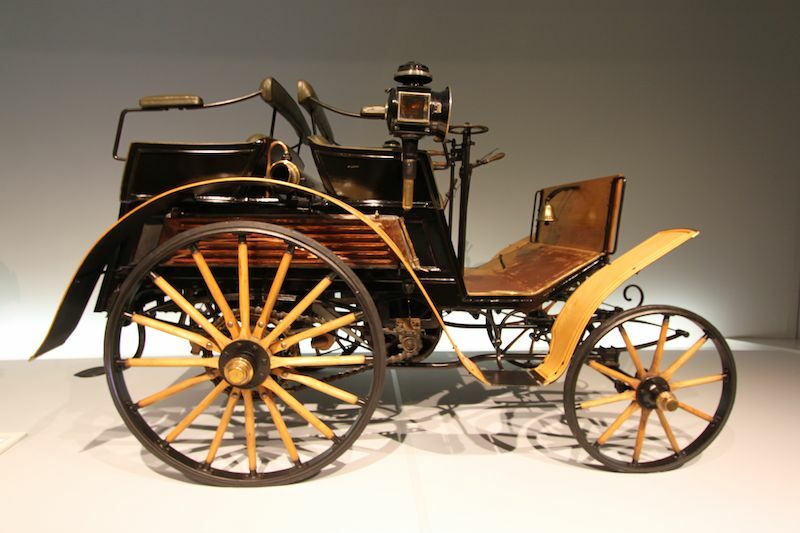 Gottlieb Daimler’s motorized carriage was the world’s first four-wheeled automobile. It was a conventional carriage into which Daimler and Wilhelm Maybach installed a small high-speed engine. Daimler and Maybach are credited with developing the world’s first small high-speed internal combustion engine to run on gasoline in 1883. The engine was a single-cylinder design, displacing 28 cu. in. and producing 1.1 hp at 650 rpm. The engine weighed 203 lbs. 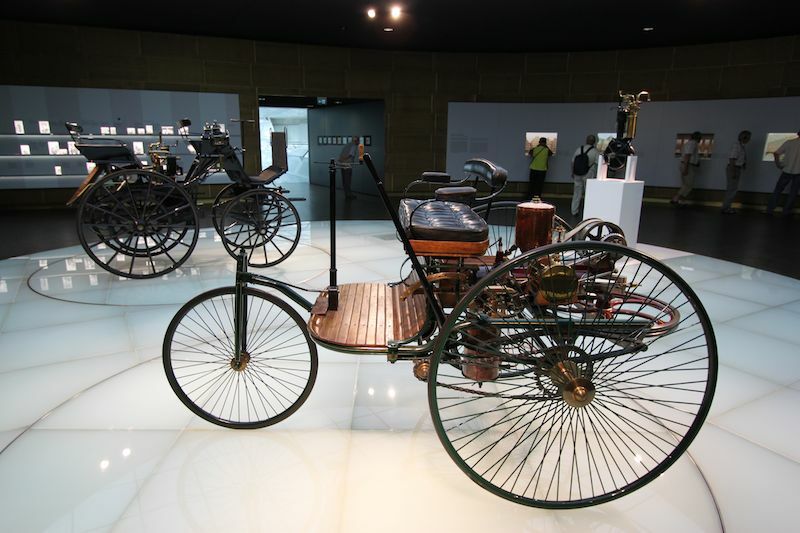 Daimler and Maybach continued their development of the automobile with a motorized quadracycle that was displayed at the 1889 World Exhibition in Paris, and reportedly sparked development of the French automobile industry. 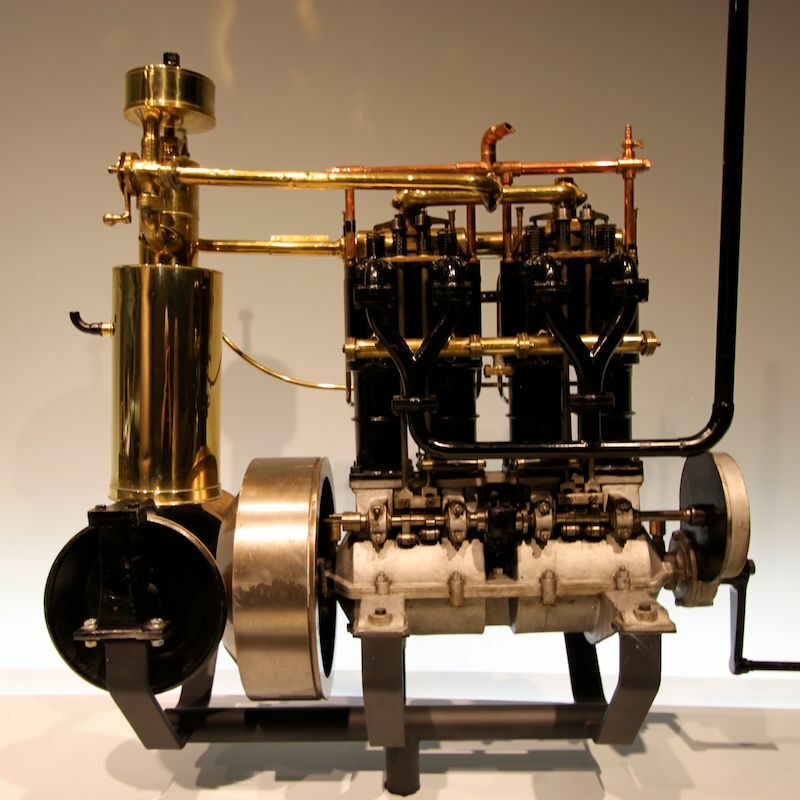 Daimler and Maybach created a first two-cylinder gasoline engine, with the cylinders arranged in a ‘V’. This engine was still only 35 cu. in., producing 1.5 hp at 700 rpm, weighing 135 lbs. and powering the Daimler Motor-Quadricycle to a top speed of 11 mph. Daimler also supplied the first four-cylinder gasoline engines to customers beginning in 1890. Two versions were offered: a 147 cu. in. inline-4 with 5.9 hp (shown) and a behemoth 371 cu. in. inline-4 providing 12 hp. Both engines were used first in boats. Four cylinder engines were not installed in road-going vehicles before 1898. The 1893 Benz Victoria was Karl Benz’ first four-wheeled automobile. The Benz Victoria utilized a one-cylinder engine of 105 cu. in., providing 3 hp at 450 rpm. 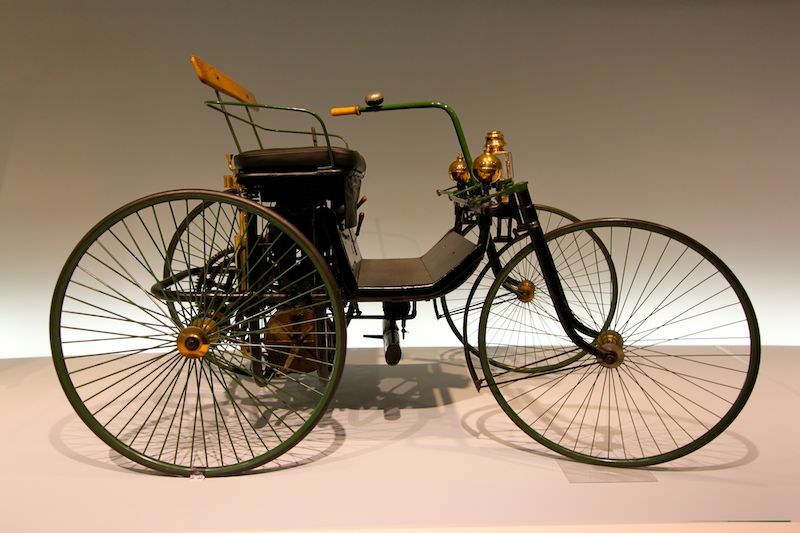 The first four-wheeled Benz was created using Karl Benz’ improvements on the kingpin steering system, permitting the two front wheels to assume different cornering radii and allowing the vehicle to negotiate bends more safely. The Daimler Vis-à-Vis introduced in 1896 was the first automobile produced in any quantity, with some 150 examples built. The two-cylinder engine displaced 65 cu. in. and produced 4.6 hp at 740 rpm. This Daimler featured three inventions by Wilhelm Maybach—the ‘Phoenix’ engine, the spray nozzle carburetor and belt drive. “Vis-à-Vis” identifies the seating style, in which passengers were seated in front of, and facing, the operator. 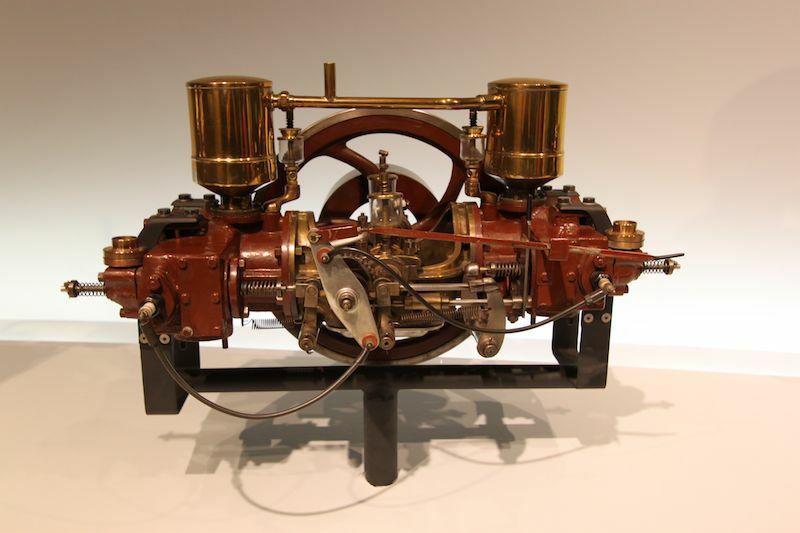 The 1899 Benz Dos-à-Dos—seating passengers back-to-back—introduced the first two-cylinder horizontally opposed gasoline engine, the Benz “Contramotor”. The 105 cu. in. engine, rated at 5 hp at 940 rpm, is the great-grandfather of every “boxer” engine in the world. Top speed was 22 mph. 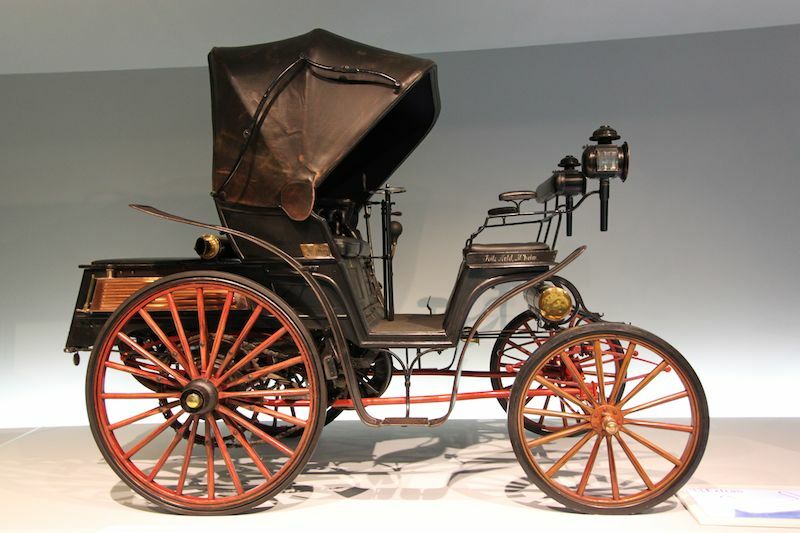 Other examples of early Daimler and Benz vehicles are fascinating both for the variety of styles represented and the mechanical innovations that progressed in rapid order. 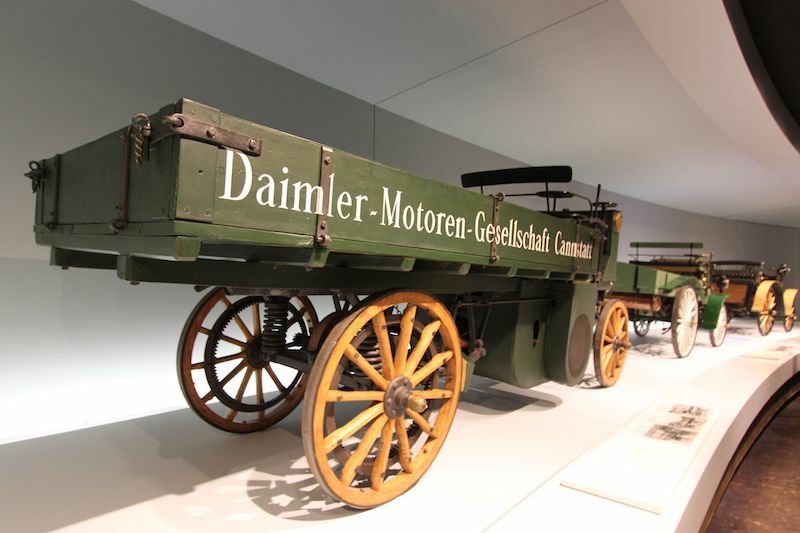 Included among these are examples of early Daimler trucks. 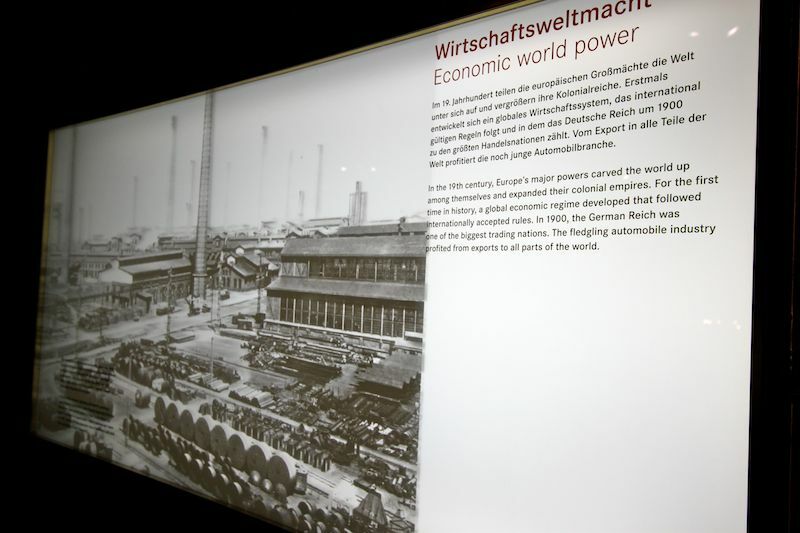 As visitors progress from an introduction to Daimler and Benz through examples of their earliest vehicles and innovations, another dimension of the museum reveals itself. The curved walkways connecting one level of the museum with the next provide a contextual history of the companies, the industry and the history of the Twentieth Century. The 1889 World Exhibition in Paris drew many innovators and brought them together as collaborators. Both Daimler and Benz were represented at the exhibition and established important working partnerships in France and elsewhere. 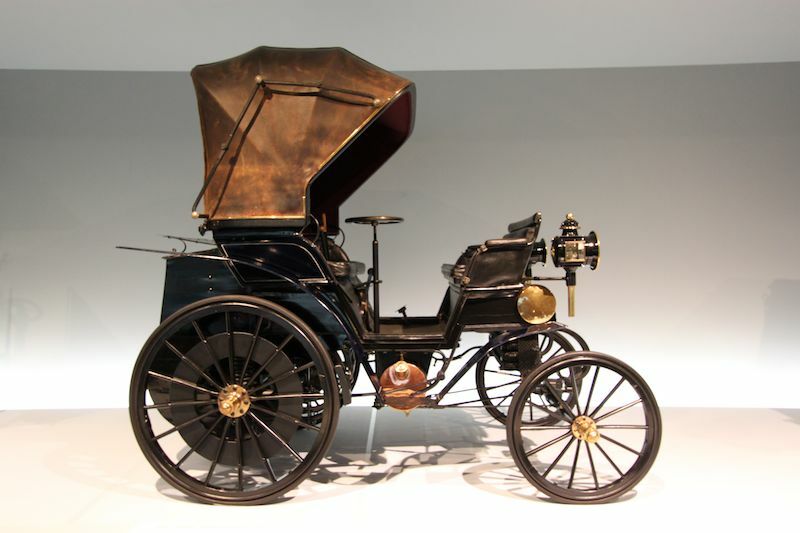 For Daimler, one of the most valuable partnerships formed in Paris was with the pioneering French manufacturer Panhard-Levassor, which began manufacturing Daimler engines under a license agreement in 1889. I visited the Museum with my brother this past summer and it was outstanding. It is definitely worth an afternoon as it not only traces the history of Mercedes Benz, but it does a tremendous job of showing the impact of the automobile and motorized transport on the world over the past 125 years. Don’t miss it if you’re in Stuttgart! Leigh Dorrington is an automotive historian and contributor to automotive publications in the U.S. and Europe including AutoWeek, Vintage Motorsport, Classic and Sports Car, MotorSport, Gasoline for Swedish hot rodders and Automobile Quarterly. The common denominators in his widespread interests and subjects are automotive design and competition.